Art Impressions Blog: Spring Fling GIVEAWAY Blog Hop! Spring Fling GIVEAWAY Blog Hop! Hooray! The 2017 Spring Fling Mega Sponsor Blog Hop Begins Today! 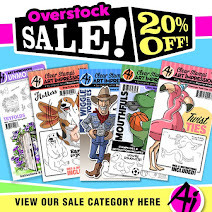 We are VERY excited to be participating in this amazing Mega Sponsor Blog Hop with our stamp-industry friends! We have joined together with 15 other stamp and papercraft companies to spread some fun inspiration, PLUS give away 16 prizes to 16 lucky winners! You might have hopped here from our friends at Our Daily Bread (Hi Rick and Kelley!). If you are looking to start from the beginning, hop over to Denami Design! The amazing Nami from their team coordinated this fun event. Thanks for getting us all together, Nami! For the first step, you can follow us on any of your favorite blog readers! 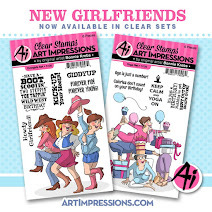 Art Impressions is offering a $50 Gift Certificate to artimpressions.com! Make sure to comment on this blog post to enter, plus there's a second gift certificate at the end of this post! Today, we have a special SPRING FLING project from Kerry Kung! Hello hello Ai friends and happy Monday to you! I'm so excited that Spring is finally here. Woohoo! Time for some beautiful flowers! And today I'm sharing a card using this adorable bunny from the Easter Blessings set. 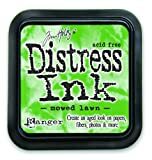 I started by creating the background using Tim Holtz distressing ink pad in broken china and mowed lawn. Then I stamped the adorable bunnies five separate times, colored them with Copic markers, and fussy cut them out. Then using adhered to card, I also used 3D foam adhesive to create some dimension with varies flowers. Then added a grass border, and finished up with 'Happiness Grows' sentiment from the WC Sentiments set. Thanks Kerry for the sweet bunny card! Make sure to comment on this post to be entered for a $50 Gift Certificate to our website. And for our BONUS $50 Gift Certificate giveaway, you can check out our social media sites to keep up on our new products, special discounts and innovative stamping ideas! What a great card Kerry! Great blog hop and so many wonderful prizes! I love the spring feel and all the flowers are making me want to go plant but we dontr have any sun! I love your interactive cards! OMG the cards is so cute and original. Very lovely bunny-really looks like spring! How adorable are these cards! I just adore those bunnies! What a darling stamp - and card! Super cute card Kerry! Love all those sweet bunnies in the blooms! Great coloring! Love all these stamps!! Thanks for the chance to win! Bunny is do cute! Love. there stamps are beautiful.love the way they use a different colors for the flowers and the bunnies are adorable. Lovely card, thanks for the chance to win and for the inspiration! Have a wonderful day! This is the cutest card. Love the design and the beautiful colors. 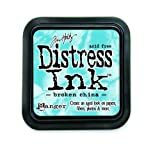 Art impressions are one of my favorite stamp brands! I love Art Impression stamp and this cute card!!!! Very cute card...love the multiple blooms. Love the bunnies! The color is amazing. Great giveaway! Those bunnies in the flowers are adorable...I can see it making the cutest new baby card! Such an awesome blog hop! Amazing talent & inspiration & great products, couldn't be any better! LOVE the bunnies in the flowers!, adorable! what a great place for baby bunnies to sleep! so cute! What a fun place to nap. What a cute card! Love the flowers and the bunnies! What an adorable card for Easter. Love the bunnies. Thanks. Beautiful coloring on the bunnies! Love the card so cute!! Waving to you from just down the road! Thanks for being a sponsor--adorable bunny & love the card! such an adorable card :) those bunnies are so cute. Those bunnies are so cute! They look comfy in their flower-beds...lol. I love love love this card! It is just too sweet for words! Great spring card too as, believe me, we have a few relatives of these bunnies in our yard now that spring is here. Oh my gosh! What a super sweet card! Those little bunnies are adorable! Cute spring cards with the bunnies! Very cute bunnies and a great hop!!! Hop!Hop! Hoppy! What a cute and pretty card! This image is so cute. Love those little bunnies. Oh, those bunnies are so sweet! This is such an adorable card! I love your coloring on the bunnies! Those bunnys are super cute! I absolutely adore the bunnies!!!!! Adore the bunnies card! These guys are so cute! awww, who wouldn't love this beautiful garden of bunnies?!! sooo adorable! What an adorable card, love it and that sentiment!! adorable card--here spring! here Spring!!! What an adorable card. That bunny is too cute. Thanks. Sweet card. Glad to have to opportunity to tell you how much I'm enjoying your stamps. I recently discovered them and have two sets so far, but hope to add to my collection. Love the card. They artwork is always so sweet. I can't wait to take classes in Aug.
What a darling card! These bunnies resting in the flowers are so cute and cheerful! They would make anyone smile! What a great hop. AI is one of my favorite companies. They make such cute designs. AI is my very favorite! Hi Bonnie & Phil! Love the little bunny in the flower, & the water coloring technique! Can't wait to take your class at Stampaway in August! I love the bunny stamp. Big blog hop ! love the bunny stamp. love the AI watercolor stamps! What a fun and cute card ! Love the bunnies! Very cute card! Love that stamp! Adorabe card! Well done! Such a fun hop! Loving it! TFS! Cutest bunnies, very pretty colors. What could be cuter than bunnies is laying in flowers!? Happy hopping! Those bunnies! Love the card, thanks for sharing! Love your stamps. I have several of the Senior ladies. So funny. But these bunnies remind me of my back yard in the spring. busy, busy. I just adore that bunny card and the colors are so pretty! I have my fingers crossed tight!!! Because I just Love Love Love your stamps! Thanks for the chance to win a great prize! I love the Bunnies. Can't go wrong with bunnies. Adorable card with the bunnies. I love the Copic coloring. Always been an AI fan! Darling card! oh my gosh those bunnies are adorable! Love how you made the sky and ground w/distress inks. Your flowers are great! Love, love you ve AI and especially the class at expos! Such adorable bunnie, such a cute card for spring! I love Art Impressions. Very sweet card! OMGosh, these bunny flowers are sooooo cute. This is so CUTE!! I love those bunnies lounging in the flowers like this. Totally FUN card!! Beautiful coloring! Love the cute little bunnies too. Adorable scene with the bunnies on the flowers. What a sweet little garden of cuties. Love all the dimension! Super cute!!! I love these honey bunnies! Cute card! love the bunnies! How cute! I love bunnies and these are just great! So fun, I love your multiple bunnies. Oh for blooming bunnies, that is so cute. The bunnies growing out of the flowers are adorable! Thank you. The bunnies are absolutely adorable. Great bunnies! Thank you for sharing! Love this - oh those bunnies are the cutest, and love the dimensional grass! Thanks for the chance to win. Those bunnies are ADORABLE. Very cute! LOVE those adorable bunnies! So cute! I love this and love that it is so original. Wow, not only cute, but so great stamping on this one! And love the soft colours! Wow! Beautiful card and hop!!! Follow your blog through BlogLovin' as Arianna Barbara and via e-mail. Adorable card, cute bunnies, thanks for sharing the copics you used. How sweet is this card, absolutely adorable! These little spring bunnies are so cute! Adorable! Cute card! That bunny stamp is so sweet....would be great fun to color. Love Art Impressions and this adorable little bunny stamp! Great and cute. Love the coloring. Thanks for sharing. Adorable and fun! Live the little bunnies! TFS! This chance is awesome and though I love these cute bunnies and this card, I am a huge fan of the divas and the get well sets. It was hard to find stores in Germany actually featuring AI. But lucky me, I stumbled across some, but my stash is still far from complete thus using this Blog-hop to tease Missy Fortune a little! Thank you so much for participating and sponsoring here! Good luck to all, but crafters are winners anyway! This card is just adorable!!! I love the cute little bunnies in the flowers!! And the dimension is so pretty. Precious bunnies! Love it! Can't wait to see what surprises are in store on your YouTube channel! What a lovely color combo -- perfect for Spring! 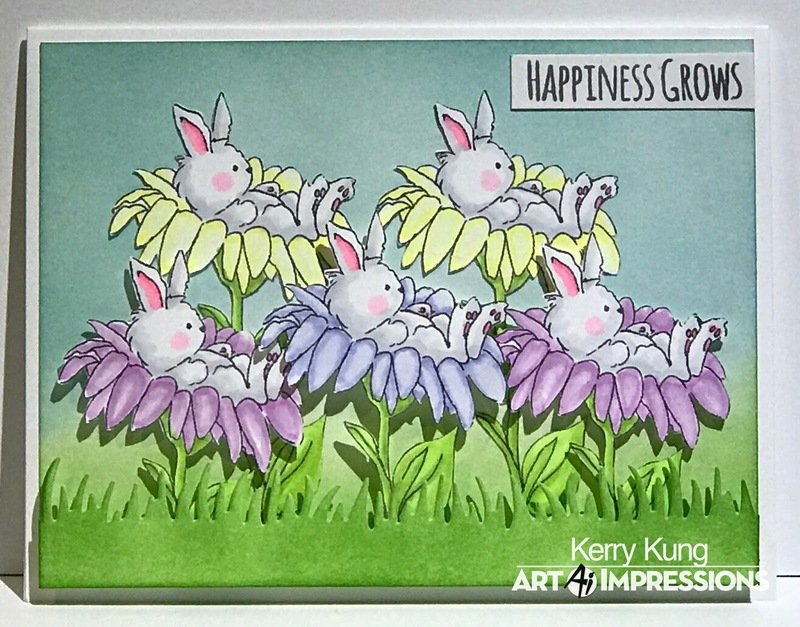 Those bunnies are adorable and I love the card that Kerry created. Very colorful and spring-like. What a cute card. The bunny image is darling. Also, what a huge gift of $50 gift certificate! Someone is going to be very happy! Adorable card, love the bunnies in the flowers stamp! What a cute card - those bunnies are adorable! Also - thanks for sharing the Copic colors you used - that is always helpful. What an adorable card! Those bunnies are just too cute! I always love everything you have on here! So cute!! How cute, looks like a bunny nursery. The rabbits on the card are adorable! Such a cute card!! I can't wait to check everything out and get some ideas! So cute! It looks like the bunnies are hanging out, watching an outdoor movie in the comfort of their flower chairs. This bunnies are so cute and sweet! beautiful card! I love your tri-folds! Thanks for doing the blog! Those bunnies are TOO darned adorable! I love your card. It is beyond adorable. Awww Kerry, your card is just adorable! I'd love a bouquet of those bunny flowers! I love a card that makes me smile! Too cute! 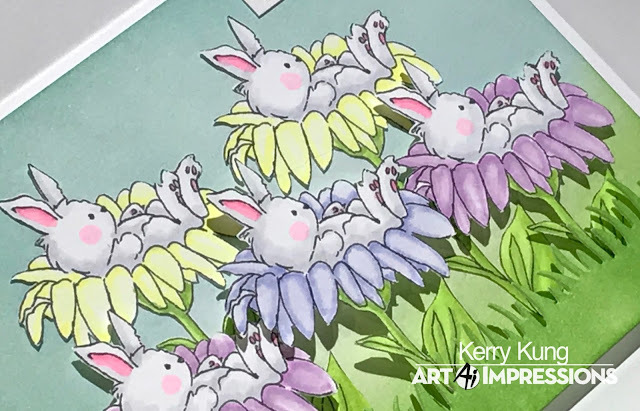 After a big Easter, the bunnies look like they are resting up in different colored flowers, just like they color their eggs, It is a cute card! Those bunnies are so adorable. Love all your videos. So fun. I just put this set away with my Easter stuff. You have inspired me to use it year round. I love all of the soft colors you used. I don't think there could be anything cuter than bunnies resting on flowers! Love the colours too. This is such a cute card! I ADORE AI products!!! How CUTE!!!! Love the soft colors and the sweet bunnies! The bunnies are so super cute!! What a darling fluffle of napping bunnies! Thanks for sponsoring this fun hop and for the extra drawing! Love the bunnies. How cute! Awwww, the spring bunnies are adorable! Happiness definitely would grow if every flower had an adorable baby bunny in it! So cute! Super cute stamp and so adorably colored and designed! Thx for the fun and the chance to win! OMG this is a super adorable stamp and the card really cute!! Adorable bunnies! Great card. Thanks for all the chances to win. love the layers on this cute card!